Appartement Sonnwies - as diverse as a sunny flower meadow ... 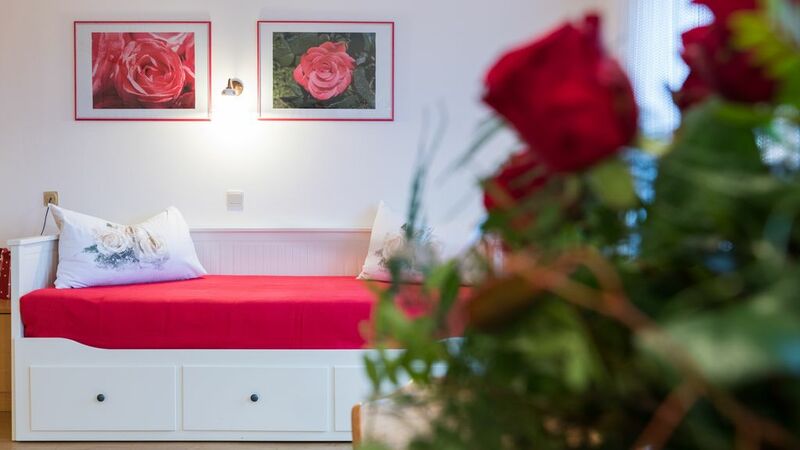 The lovingly furnished apartments rose, bellflower, sunflower and Buttercup (for 2 to 6 persons) are all equipped with Internet wireless LAN, satellite TV, telephone, clock radio, safe, hair dryer, towels, sheets, electric shutters. Kitchen equipment: electric cooktop, dishes for 2-6 persons, kitchen accessories, refrigerator, coffee maker, and V. M.. The absolute highlight is the sunny south-facing balcony with views of the surrounding mountains of the Meran country. The Rose apartment has 1 bedroom, 1 bathroom (shower / toilet) and a large living room with kitchen with sofa bed for two additional guests. Inside you will find: free parking and garage, free wireless LAN and internet point, lounge with children's corner, home library, small gym, table tennis, table football, and V. M..
Un posto molto carino in alto e fresco vicino a Merano. Anche Bolzano non è lontano. Un'accoglienza molto cordiale ed un trattamento non da meno. Casa nuova pluriappartamenti, pulita ed accogliente. Garage ed altri servizi. Paesino fresco e vicino ai sentieri per passeggiate, cibo buono e gente cordiale. Bei Aufenthalten von weniger als 7 Tagen berechnen wir eine Reinigungsgebühr von € 20,00.